I wish I had a cool story as to why I made these cookies but I don't. I was just craving some cookies and since I am eating Paelo I wanted to make sure all the ingredients used were top notch and Paleo friendly. 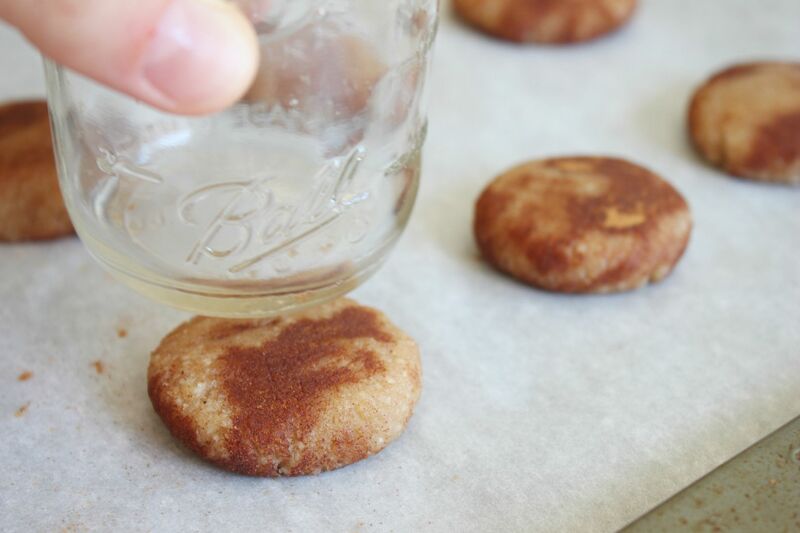 I also am really wishing fall would hurry up and get here and nothing screams fall like a house full of freshly baked cinnamon snicker doodle cookies (never mind the fact that it was over 100 degrees outside when these were baking). I did a little searching and used this recipe as a guideline with just a few little modifications. Combine all the ingredients together in a bowl and mix well. Cover the cookie dough and place in the fridge to chill for one hour. 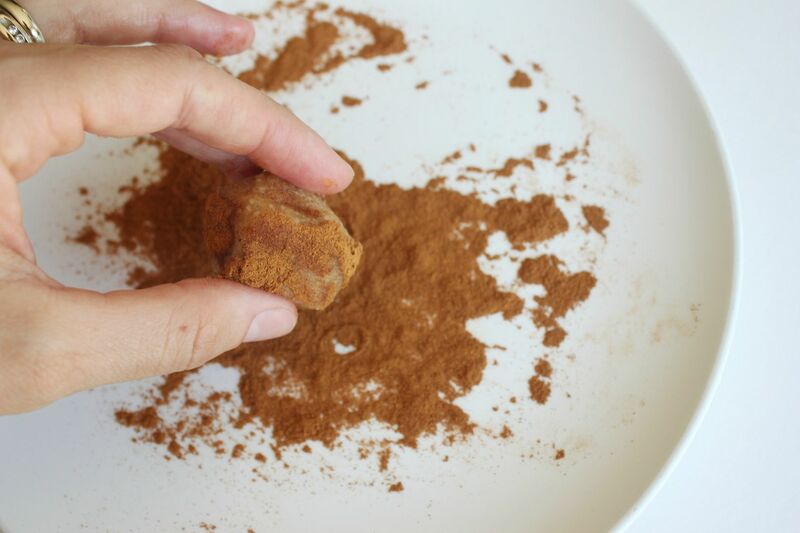 Roll the cookies into small balls and coat in cinnamon. Use the bottom of a cup or jar to flatten them out. Place cookies on a parchment lined cookie sheet and bake for 10 minutes. The end result is a soft almost dough like cookie that has just the right amount of sweetness and spice. My husband, who is my true taste tester (and not always so nice with his "constructive criticism") said these were, "BOMB." He ended up eating almost the entire batch himself. I would say this recipe was a success. This recipe makes 14 cookies and each cookie has approx 5 grams of effective carbohydrate. On a side note: I just googled, "When does fall start?" and it is September 22 just FYI. Wooo just a month away! I am with you-I can't wait for fall! But at the same time, I know that means winter....which I don't want to start! I am loving this recipe. I used to adore snickerdoodles!!! Snickerdoodles are my all time favorite cookies!! I've been dying to make some since the weather should be cooling off soon (should). they definately worth a try! you had me at cookie. These look delicious. Must try these this week! Follow up: I just made this, and I am about...3 cookies shy of eating the whole batch. BEST paleo cookies to date. Better than the original. SO GOOD!! these are dangerously good! Mmmn... they look so yummy. I have to see if I can get all the ingredients here and try to make them. I'm attempting to go gluten free, so these look awesome for my new plan! looks SO good!! Love all of your recipe posts!! How do you like the paleo lifestyle? Do you notice a difference? Kyla- for this particular recipe I am not sure since I have only used almond meal, using a different flour might compromise the taste. Made these last night! The hub and I are rounding out our first week going paleo, so this was a VERY welcome treat. SO delicious - thanks! These are SO good! I used to make a "paleo" snicker doodle with just coconut flour but I really liked the texture that the almond meal gave these instead. Lindsay, your sweet aunt Stephanie sent me to your blog. I was recently diagnosed with diabetes, and am excited to find some yummy recipes to try here. Thank you! We have had to eat a low-carb, no sugar, grain-free diet since March due to my 5 year-old having a systemic yeast build-up in his small intestines. I am so excited to find these cookies because they will be perfect for him. THANK YOU! I made these and they are very good. However, I do feel like there was too much coconut and I didn't like the oily after taste. I substituted the oil for unsweetened apple sauce and they were out of this world. Thanks again for a great recipe! Try giving your 5yr old probiotics along with the diet. This will help to even out the good and bad bacteria and will kill fungal yeast in the gut. (of course you should ask the doctor, but don't always expect the doctor to be thrilled with using a homeopathic remedy).That's when your motherly instincts must kick in and also do some reading on the internet about probiotics if you haven't already. They are as safe as eating yoghurt. Good luck! Could you use xylitol or stevia instead of honey? I am on a strict no sugar diet (that includes honey or agave). These look AMAZING!! what can i use in replace of almond meal. I have two children the are allergic to all nuts, but i know they would love a lot of these recipes. Thanx, this blog is a life saver!!! I made these (twice) with my 2 1/2 yr old last week. He loved rolling them into balls and then smooshing them flat and sprinkling with cinnamon. Love that they are egg free, since we are both allergic. I've made these 4 times now and I can't get enough of them. Fantastic recipe!!!! I made these with my two year old last week. They were delicious. I definitely will be making these again. I have been eating low carb and your blog has been a fantastic source for recipes. Thanks so much. 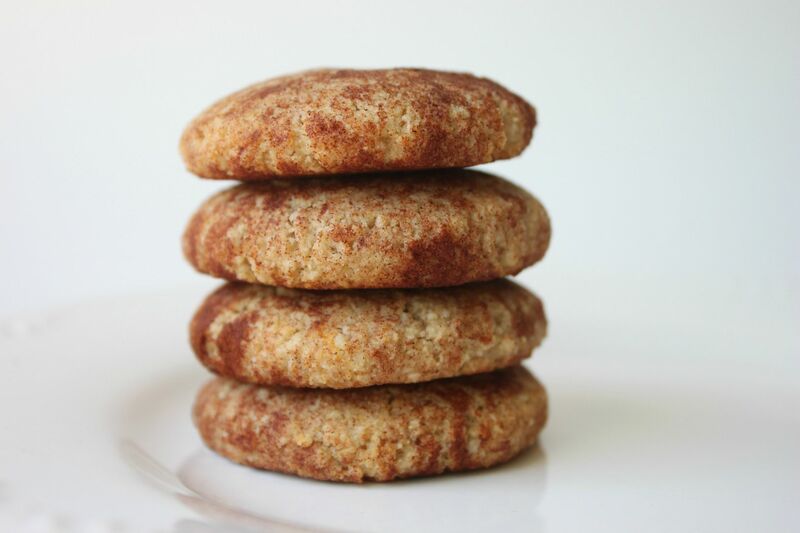 One of my favorite cookie at Christmas time is a good snickerdoodle. I have not tried this recipe but plan on it today. In my non-paleo, non-GF recipe, I have always added cream of tartar. Since I am strictly a recipe FOLLOWER and not an experimenter, I am not sure how to incorporate it or even if I can. I usually add 2tsp CofT but that is with regular flour and 1 tsp baking soda. Any thoughts? These seriously might be the best gluten/grain free cookies that don't take hours to make (no crazy flour mix!) I have ever made. Delicious! Thanks for the recipe! I made these for Valentine's Day, and they were a hit!! Silly question though - if I were to leave out the cinnamon and nutmeg, would I just get a vanilla-flavoured cookie? I'd like an easy recipe for that too, and seeing as I already have the ingredients for this recipe, I figured I'd ask. Heading to the kitchen to make these right now to put in DD2s lunch tomorrow. She's not so keen on going GF; hopefully these will brighten her day. Thanks for sharing! where do you find these ingredients? these look amazing and i am just starting the paleo! I've been going through lots of trial and error recipes for paleo cookies. This recipe was such a pleasant surprise! I noticed that a lot of these recipes have honey in them. Honey has too many carbs for me. Any ideas of what sweetener I could use in place of the honey? Can I sub maple syrup for the honey? Delicious! I substituted Palm shortening for the coconut oil since I wasn't able to get one at the local supermarket, and they turned out really well :) Just made them in my dorm kitchen. This college student thanks you wholeheartedly!!! Hmmm... These are not very good. I must have done something wrong. 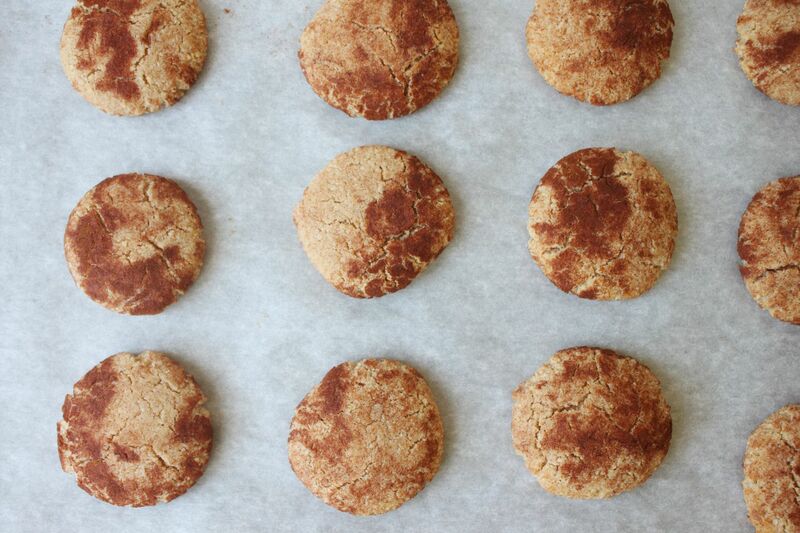 They are edible, but they do not resemble snickerdoodles. I used the almond meal that I made from almond pulp after making almomd milk. Do you think this is the issue? Annonymous and Patti Lewis- For this recipe I do not recommend using left over almond pulp.